Those people are no doubt doing much a better job of explaining the value of their work than you are. They know how to make people want what they’ve got to offer. As hard as it can be to “sell yourself,” it’s your j-o-b when you work for yourself. No one else is going to do it. And your dream clients won’t one day wake up, mysteriously discover your work & immediately decide to buy from you. You’ve got to persuade them. You’ve got to make them have that “omg this woman speaks my language; I neeeeeed to work with her” moment that has them hitting the ‘buy now’ button. Show people a peek at how their life will change after working with you. Most people spend far too much time explaining WHAT they do, but not enough time explaining why their dream clients should care. And why should your reader care? Because you can change her life. She has problems that you can solve for her. She currently has a problem (X). But she wishes that she didn’t & her life / business was different (Y). And you’re the bridge that can get her from X to Y. By focusing on the fact you’re going to help get her from X to Y, you’re articulating the VALUE in what you do & telling her why she should care about your work enough to part with her hard-earned dollars. In other words, you’re explaining the BENEFIT of your work, not just the FEATURES of your offer. What’s the difference between a feature & a benefit? A feature is a unique part of your product or service. A benefit is the value your customer gets from the using the feature. Benefits tells your customer what’s in it for you. Benefit: 1,000 songs in your pocket that you can listen to on the go. Then, the benefit answers that question & explains exactly why you’d want 1GB of storage… because you get 1,000 songs in your pocket. Features are often too technical. Too jargon-y. Too blah. They bore you to the point that you may want to stop reading. 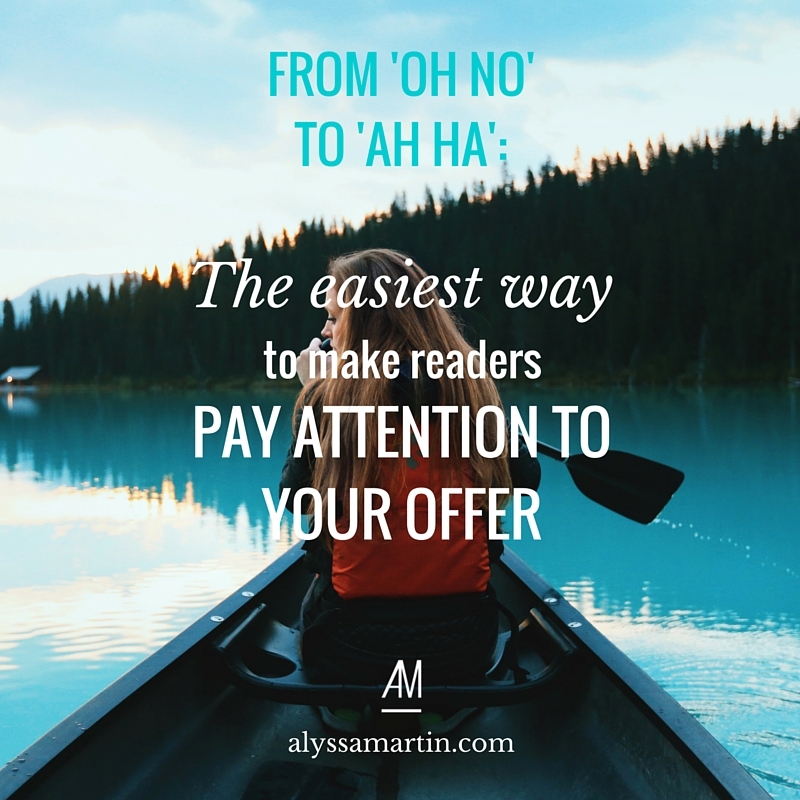 Your benefits helps you to communicate why your readers should want what you’ve got. They’re the meaty part of your web copy. Without them, your visitors are just a click away from leaving your site in favour of another scroll through their Facebook feed. To separate your benefits from your product or service’s features, you ask yourself: So what? You get a good night sleep. You wake up feeling refreshed, ready to leap out of bed & tackle your day. And you don’t have to worry about whether you’ve got the energy to get everything on your to-do list done anymore because you’re well rested. Real benefits connect to your reader’s core desires. They aren’t really dreaming of a well-supported back, so you know you need to dig deeper – keep asking, “so what?” They’re really dreaming of sleep-filled nights & pain-free days. You went from reading some mundane statement about a firm mattress, to reading something that makes you sit up & pay attention because it talks about something you genuinely want. Now, you understand what the feature (i.e. the firm mattress) really does for you, and it’s suddenly far more persuasive than the feature on its own. This technique helps you stop talking too much about yourself & focus on how your products or services can transform your client’s lives. (We already know how important that is.) Ultimately, your business is all about them – and you want to make sure they know it by connecting their desires with your offering. When your web copy focuses on your dream client & what you can do for them, it becomes so much more compelling. Try it out & see how much longer they stay on your site & pay attention to your offerings. If you’re struggling with getting your web copy from bland to bold… from cluttered to clear, you might appreciate my Mindful Messaging coaching sessions. They’re designed to help you find the clarity & the words to get your dream clients to leap at the chance to work with you. Spend 90 minutes with me & get copywriting that brings confidence, clarity & clients. Find out more over here.